. . . might just be Delawareís best kept secret, but not for much longer. Quickly becoming the premier entertainment venue ‘south of the canal’, the Schwartz is loved by entertainers and audiences alike for its ambience, dance floor and state-of-the-art sound and lighting. 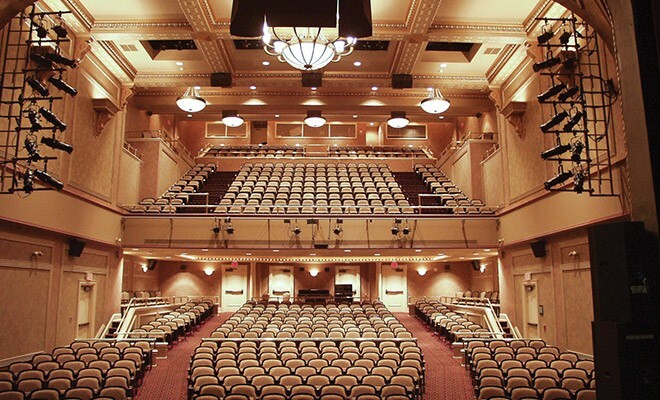 On its stage, audiences will find everything from emerging to internationally acclaimed performers of music, dance, theater and comedy. Recently, the Schwartz Center presented acts such as the Off-Broadway sensation Alive 55+ And Kickin’ and music legends of all genres. Tribute bands featuring songs of the Eagles, Chicago, and Amy Winehose were a hit in 2016 and will be featured in 2017, beginning with a tribute to Willie Nelson that is sure to sell out. In addition to music, the Schwartz Center has showcased a variety of national and regional talent, offering theater, comedy, dance and independent films. Local and regional dance companies, theatrical groups, symphonies and choral societies call the Schwartz home. The Schwartz Center has a full array of talent on tap for 2017, including a Lip Sync Battle and Masquerade Ball featuring music by Zydeco A Go Go in February. March is packed with entertainment, starting off with Jazz greats Pieces Of A Dream, then two shows in celebration of St. Patrick’s Day with Irish musicians Caladh Nua and Irish dancers Rhythm In The Night. March wraps up with music by nationally acclaimed The Bumper Jacksons. Looking ahead to April, Civil War: The Musical will run two weekends and entertain audiences of all ages. Many local and regional productions, as well as film favorites, will be offered as well during this time. For a full lineup, tickets and information visit schwartzcenter.com or call the Box Office at 302-678-5152 . Starting in 2017, the Schwartz will return to screening films. These ‘Capitol Classics’ will premiere as a nod to the Schwartz’s roots as the Capitol Theater. In preparation, the Rocky Horror Picture Show was shown at Halloween and A Christmas Story was offered during the Christmas season. Full audiences enjoyed both screenings. Tickets are already on sale for the Wild About Wilder Weekend featuring Gene Wilder staring in Charlie and the Chocolate Factory and Blazing Saddles. In addition to weekend features such as these, matinees on Wednesdays will be offered throughout the year to supplement live entertainment, which is a mainstay of the Schwartz Center’s programming. One of the most popular attributes of the Schwartz Center is its concessions which can be enjoyed during the show. Patrons can select from a reasonably-priced lineup of snacks and candies as well as beverages of all types, including a full bar at most shows. Ample parking is available on nights and weekends in nearby parking lots. Several dining establishments are nearby which offer a discount to Schwartz Center ticket holders on the day of the show. Within walking distance, patrons will find trendy shops, bakeries, museums, galleries, taverns and more to make the visit to Dover memorable. 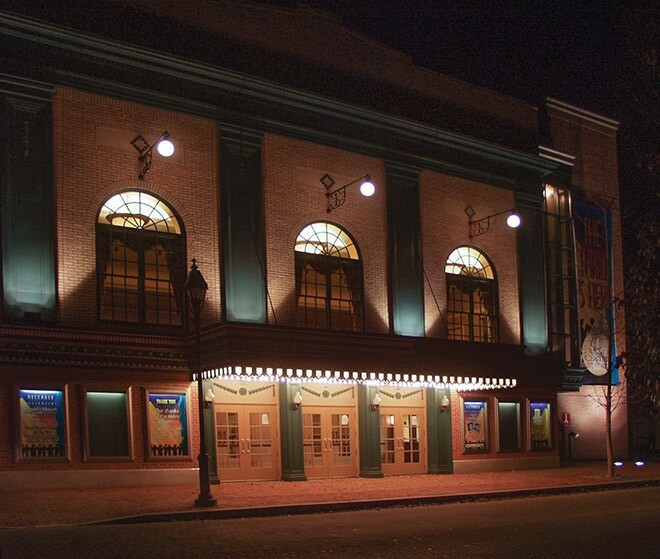 Located in historic downtown Dover, the 550-seat theater is just part of what the Schwartz Center has to offer. Meeting rooms on the second and third floors are available for use. Both are accessible by elevator and are served by a catering kitchen. Whether it’s a small intimate event in one room or a full day event utilizing the whole building, the Schwartz Center is a fantastic option for event planners and fundraisers. With a Rental Coordinator on staff, it is easy to explore options for making the Schwartz home to nearly any event. One thing that is becoming popular is for companies to buy a block of tickets to a show and host a private cocktail party or happy hour in one of the meeting rooms prior to the show. What a tasteful way to celebrate with employees or entertain clients without having to plan a full evening of entertainment! Companies and individuals wishing to support the arts through the Schwartz Center have a variety of options at all funding levels of sponsorship and membership. Details explaining these options are available on the Schwartz Center’s website www.schewartzcenter.com. “I’ve been to all kinds of shows at the Schwartz. Reasonably priced shows and adult beverages.” – Mark S.
“Not a bad seat in the house! Great location, fair pricing, never had an issue with parking and the building is beautiful. The array of different types of shows makes me happy someone there cares enough to bring all kinds of acts and plays to our town. Never have been unhappy leaving!”- Lauren W.
“Beautiful building! Comfortable seating! Pleasant staff! Will definitely come back for more shows!” – Amanda W.